The GTX 680 also benefits from several improvements to cooling design. The fan is composed of acoustic dampening materials for a significant noise reduction and more enjoyable gaming experience. The custom fin stack is both shaped for better airflow and embedded with a high efficiency heat pipe to effectively cool the card without circulating heat back into the system. The thermal output of the GTX 680 has also been greatly reduced with a TDP of 195W for cooler and more energy efficient operation. 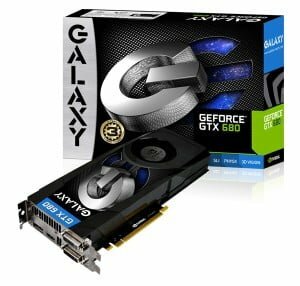 The new SMX architecture present in the Galaxy GTX 680 allows for a staggering 1536 CUDA cores- 3 times the number found in the flagship GTX 580 of the previous generation. Improved architecture coupled with almost 50% higher core and memory clocks results in an astounding level of pure gaming power. This extra performance is crucial for gamers who want to take advantage of the GTX 680’s ability to simultaneously power up to 4 displays. Users will be able to game in NVIDIA 3D Vision Surround on up to 3 displays, and can add a 4th accessory display for email, chat, web browsing, and more without leaving the game. The card features a flexible assortment of outputs, including DVI-I, DVI-D, HDMI, and DisplayPort, as well as an adapter for a VGA display. The Galaxy GTX 680 sets the new standard in high performance graphics and is available now at leading retailers and etailers: Newegg, TigerDirect, Best Buy, Amazon, and NCIX.